As a parent of a child with an autism spectrum disorder, I do my best to try and keep up with any new developments. It is not an easy task-the causes of autism remain mysterious and it is never easy to distinguish the information from the misinformation or the science from the pseudo-science. Currently, 1 in 68 children in the USA are affected by autism; a figure which has increased significantly over the past few decades. Exactly how much of this increase in numbers is down to improved diagnoses is unknown but it is not surprising that experts and worried parents alike are searching for answers. There is significant controversy surrounding the causes of autism and most people will be familiar with the vaccine theories. However, one of the most controversial theories put forward in recent years was made by Dr. Stephanie Seneff a PhD and senior research biologist at MIT with some 170 peer reviewed papers to her name. • The main cause is the overuse of Monsanto’s best-selling pesticide ‘Roundup’ which contains glyphosate. 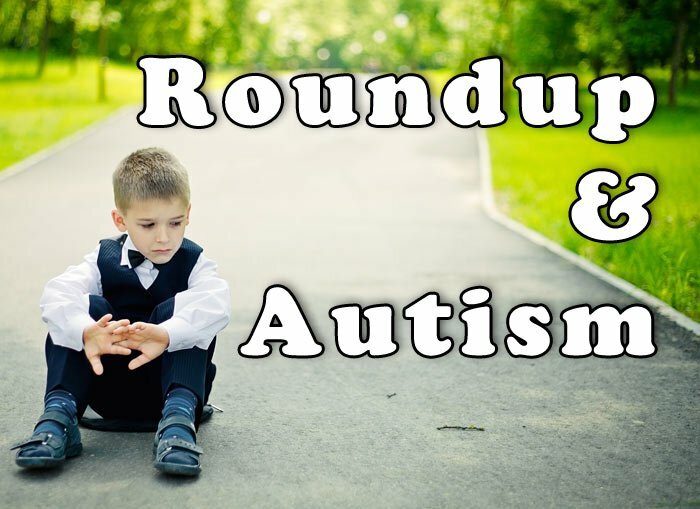 • As well as autism, the excessive use of glyphosate in food causes many other diseases including Alzheimer’s, cancer and cardiovascular diseases. Dr. Seneff pointed out how ubiquitous the use of glyphosate was. Because glyphosate is used to treat corn and soy, nearly all soft drinks, candies, chips and many cereals containing soy fillers have a certain amount of glyphosate. Poultry and beef products also contain glyphosate since chickens and cattle are fed with GMO treated corn and soy. She went on to say that wheat often gets sprayed with Roundup immediately before it is harvested meaning that wheat and bread products are also potential sources of glyphosate. While each product might not contain large quantities of glyphosate, the cumulative effects of eating many products are potentially devastating especially considering the amount of processed foods which make up a large part of the modern Western diet. I have a very open mind when it comes to the causes of autism and I also have something of a vested interest but apart from a line graph purporting to show the correlation between the increasing use of glyphosate there is little scientific evidence to be gleaned from the speech. 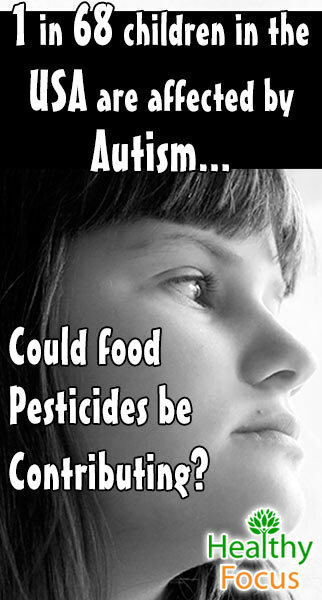 She does point out however that children diagnosed with autism tend to have bio-markers indicating excessive glyphosate consumption. These bio-markers include iron and zinc deficiencies, low levels of serum sulfate, mitochondrial disorder and regular seizures. To the skeptical eye however, none of this evidence looks especially strong. 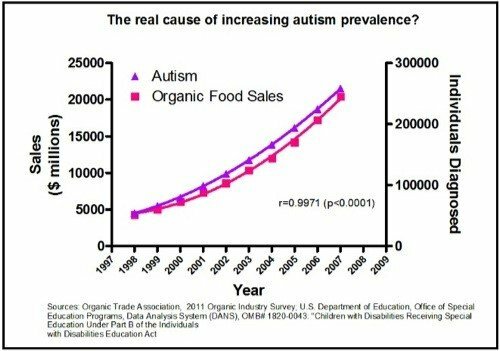 The line graph presented has been the object of quite a bit of ridicule with some creative cynics uploading graphs showing a similar correlation between increasing autism rates and he sales of organic food. One of the biggest problems with the evidence presented at the conference was the lack of actual evidence. The talk begins by saying there is a consistent correlation between the use of Monsanto’s Roundup and the rising numbers of children diagnosed with autism. However, Dr. Seneff also jumped around and appeared to lack real focus. She also discussed the link between rising vaccination rates and autism and pointed out that there was a correlation but the vaccine correlation was not as close as the correlation to Roundup. However, while Dr. Seneff uses the correlation to prove her point, there is little discussion of how exactly Roundup leads to autism. Perhaps significantly, the original article and Dr. Seneff’s biography make mention of her work with AutismOne who are basically a group of concerned parents that believe autism is caused by environmental triggers rather than the mainstream scientific belief that it is caused by genetic factors. AutismOne on their web page explains that autism is caused by environmental triggers and is both preventable and treatable. The present epidemic they say has nothing to do with bad genes or improved diagnosis. Whether or not Dr. Seneff’s scary prediction comes to pass remains to be seen but there is no doubt that autism figures are reaching epidemic proportions. However, the CDC explained in their autism surveillance survey in 2014 that it could not rule out improved diagnoses in the apparently increasing prevalence of autism in children. The number of children diagnosed with autism has increased between 20 and 30 fold since the earliest studies were done in the 1960s and early 70s. European estimates from these early studies were that as few as one in 2,500 children had autism. His figure rose sharply to between 1% and 2% by the year 2000. How much of this increase in autism prevalence is down to diagnostic factors and better awareness is difficult to gauge. I have no figures to hand but I can tell you that from personal experience in Thailand, there was absolutely no awareness of the illness at all until the last decade so the figures in certain parts of the world will show even higher increases than those in Europe and the USA. While most commenters say that the evidence presented is weak, Dr. Seneff does make some attempt to link the use of glyphosate to autism biologically. According to Dr.Seneff, glyphosate works by interrupting the shikimate pathway which is a metabolic function of plants allowing them to produce amino acids. She goes on to say that interrupting this path leads to the plant’s death and since humans do not have this shikimate pathway, it had been assumed glyphosate was harmless to us. However, according to Dr. Seneff, the bacteria in our bodies do have this pathway and the millions of so called good bacteria or gut flora in the human body can be adversely affected. Moreover, according to Dr. Seneff her research has demonstrated that glyphosate can damage liver function and says this is a possible explanation for the growing numbers of people suffering from a deficiency in vitamin D. As well as inhibiting proper liver function, she claims glyphosate may be responsible in part for poor kidney function as well as certain gastrointestinal conditions such as celiac disease. As a parent with an autistic child, I am more than willing to keep an open mind and feel that many people are too quick to ridicule new theories. People who question the motivations of giant companies and big pharma are often quickly cast into the role of wacko-conspiracy theorist. There is no doubt that autism rates are rising and continue to rise around the globe and this has to be a cause for concern. Having said all that, I think we need far more comprehensive evidence than the vague corroborating link provided regarding glyphosate. I am sure we would all welcome progress in the field and look forward to the trend being halted or reversed.